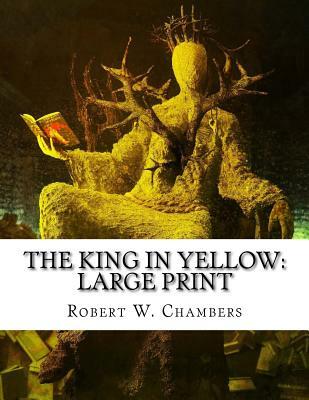 The King in Yellow: Large Print By Robert W. Chambers "Every story of The King in Yellow has something riveting about it ... so perfectly realized, they became the model for much of twentieth-century horror/fantasy." - New York Press One of the most important works of American supernatural fiction since those of Poe, The King in Yellow was among the first attempts to establish the horror of the nameless and the unimaginable. A treasured source used by almost all the significant writers in the American pulp tradition - H. P. Lovecraft, A. Merritt, Robert E. Howard, and many others - it endures as a work of remarkable power and one of the most chillingly original books in the genre. This collection reprints all the supernatural stories from The King in Yellow, including the grisly "Yellow Sign," the disquieting "Repairer of Reputations," the tender "Demoiselle d'Ys," and others. Robert W. Chambers' finest stories from other sources have also been added, such as the thrilling "Maker of Moons" and "The Messenger." In addition, an unusual pleasure awaits those who know Chambers only by his horror stories: three of his finest early biological science-fiction fantasies from In Search of the Unknown appear here as well. We are delighted to publish this classic book as part of our extensive Classic Library collection. Many of the books in our collection have been out of print for decades, and therefore have not been accessible to the general public. The aim of our publishing program is to facilitate rapid access to this vast reservoir of literature, and our view is that this is a significant literary work, which deserves to be brought back into print after many decades. The contents of the vast majority of titles in the Classic Library have been scanned from the original works. To ensure a high quality product, each title has been meticulously hand curated by our staff. Our philosophy has been guided by a desire to provide the reader with a book that is as close as possible to ownership of the original work. We hope that you will enjoy this wonderful classic work, and that for you it becomes an enriching experience.